This is a moderately challenging tour which is suitable for experienced walkers with a good general physical condition. 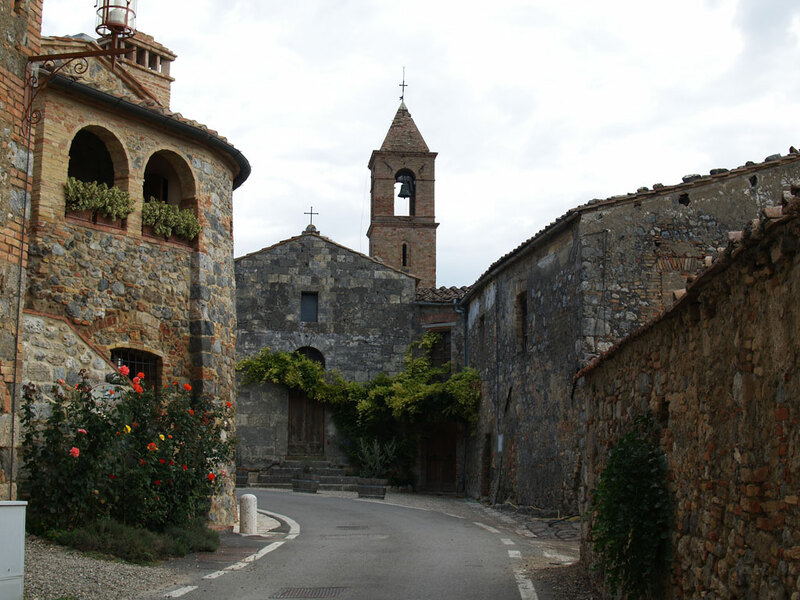 Through the extensive footpath network of the area, roughly following the traces of the Via Francigena, one of Europe’s most important ‘highways’ in medieval times, you walk from village to village, a full immersion in the world-famous Tuscan landscape, until arriving on the shore of Lake Bolsena, in the Etruscan heartland. 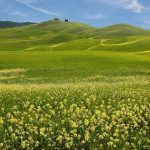 This part of the Via Francigena is among the most scenic and (with the small detour) gives you a great opportunity to discover the beautiful Val d’Orcia, perhaps the quintessential Tuscan landscape, not without reason listed as a World Heritage site. 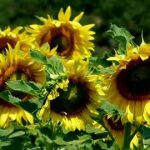 Of course the emphasis of the tour is to enjoy the walking through this beautiful countryside, the rolling vineyards, the poppies in Spring and the wild cyclamen in autumn. Most of all, many of the views have barely changed for hundreds of years. 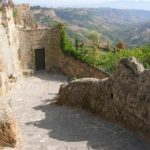 But the mere fact that you are walking along a centuries old ‘footpath’, of which most parts date back to the Roman times, will give you a good insight in the history of the places you will pass through. 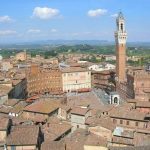 You will also have time to visit the beautiful medieval villages and historic towns along the Via Francigena, as this tour threads together some of the most attractive towns and villages in southern Tuscany and northern Lazio in an eloquent procession. 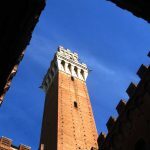 Starting from beautiful Siena, you’ll pass through Ponte d’Arbia e Buonconvento. Then you’ll leave the main route of the Francigena, in order to walk some of the most stunning trails through Tuscany and visit some of its real highlights: Montalcino and the Abbey of Sant’Antimo. Near San Quirico we’ll pick up the Via Francigena again. We’ll walk past beautiful Ripa d’Orcia, visit the thermal springs at Bagno Vignoni walk up the hills to Castiglione and then to the stunning hilltop town of Radicofani. 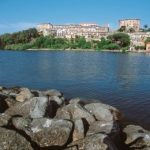 Then we’ll leave Tuscany and cross the border with Lazio, where we’ll have the chance to visit the small jewels of Proceno, Acquapendente and finally arrive on the shores of Lake Bolsena, known as the ‘Etruscan Lake’. Here you can rest, before tackling the last section of the Via Francigena to Rome, or travel to beautiful Orvieto. Arrival in Siena, where you settle in at your centrally located hotel Depending on your arrival time, you can go for a short visit to this beautiful old town, one of the best preserved medieval towns in Italy, known for its beautiful heart shape central square and its stunning – though unfinished ‘Duomo’. 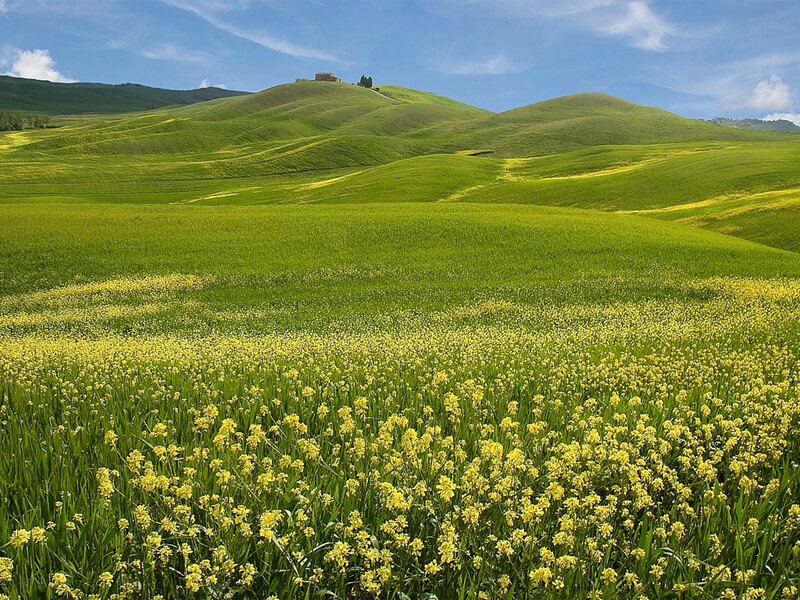 The first day walk takes you out of Siena into the hills of the Val d’Arbia. After having left the outskirts of town, you’ll be walking mostly along the typical ‘strade bianche’, unsurfaced country roads, through the rolling landscape, which offers some nice views. 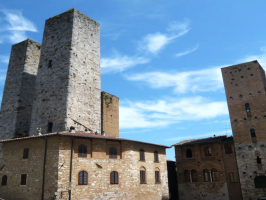 You’ll pass along some interesting places: the impressive Grancia di Cuna, a fortified farm where once the wheat reserves of wheat of the Republic of Siena were stored, Monteroni d’Arbia and the fortified village of Lucignano, your final destination for today. Total walking distance: 25 km. Estimated walking time: around 6,5 hours + sightseeing time. Today you continue your walk in southern direction. The first village you encounter is Ponte d’Arbia, a small village at the bridge over the River Arbia. Then, after slightly over an hour through the rolling hills, you reach the charming walled town of Buonconvento, the town where Emperor Henry VII died in 1313. Here you walk straight through the old town and have the time for a short coffee break. 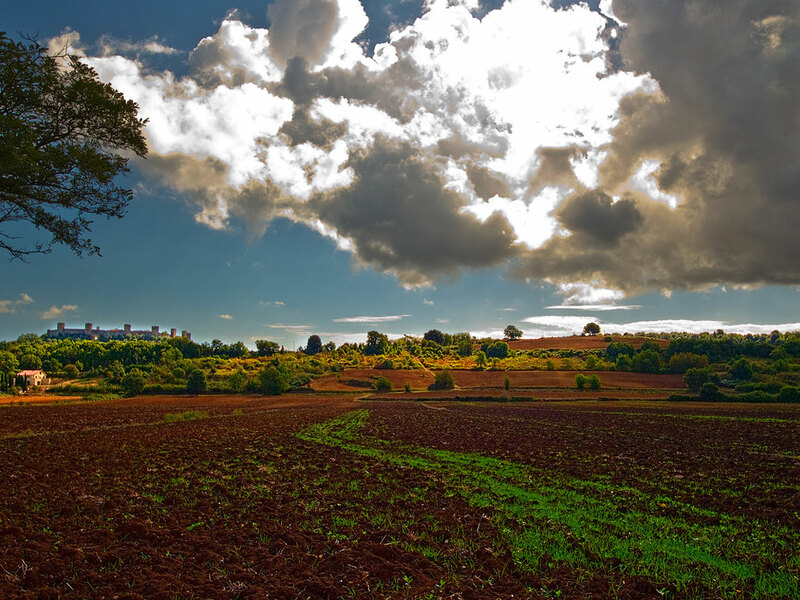 After Buonconvento you will walk through the plain for about an hour, always with the silhouette of the hilltop town of Montalcino, the highest and one of the most scenic villages of the area, in front of you. 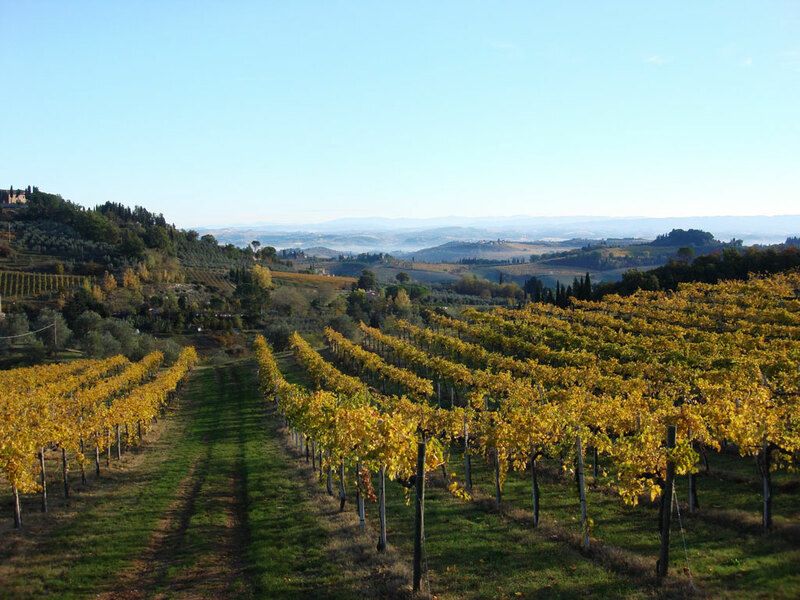 After this flat stretch you’ll start walking up the first hills, through the area of the Brunello di Montalcino, one of the best Tuscan red wines. 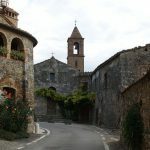 Here you’ll leave the official route of the Via Francigena and continue to climb up to Montalcino, where you’ll stay overnight. Do take the time to visit the castle (which also has a wine museum) and the beautiful old town, with stunning views all around. Total walking distance: 18 km. Estimated walking time: around 4,5 hours + sightseeing time. After an relaxed breakfast you leave Montalcino in southern direction. 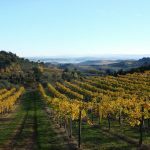 The first part of your route takes you partly through the vineyards, and partly through the more forested landscape south of Montalcino. 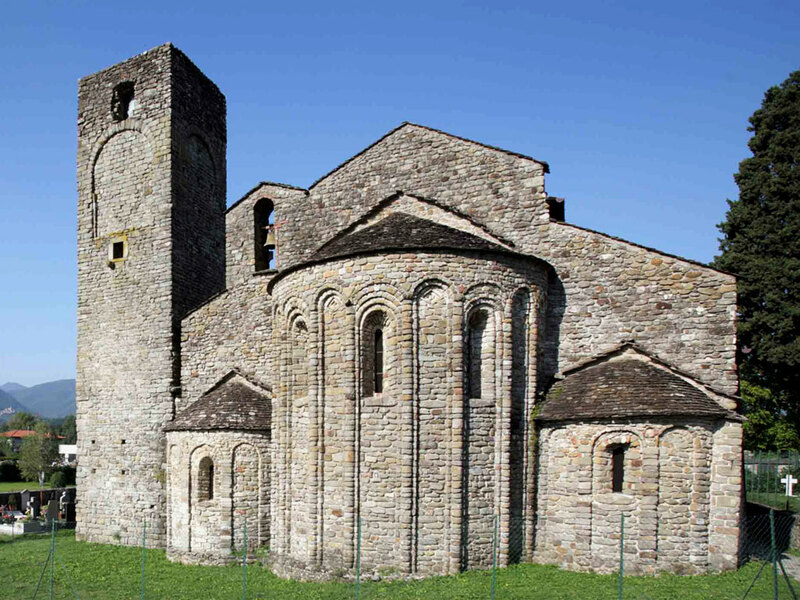 The goal of the walk is to reach the stunning Abbey of Sant’Antimo (Abbazia di Sant’Antimo), according to many “one of the finest Romanesque religious buildings in Italy”. 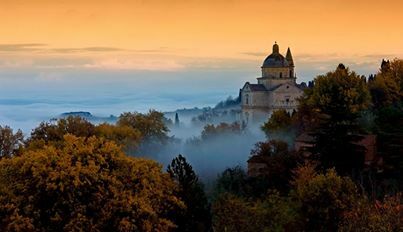 The church dates from the 12th century and is built in a picture-perfect setting, in a large valley with views of the hill town Castelnuovo dell’Abate, rolling hills covered in olive groves and vineyards, and wild forests. You’ll have the time to relax and perhaps have the chance to listen to the chant of the monks. Total walking distance: 14 km. Estimated walking time: around 4 hours + sightseeing time (5 hours with extra option). 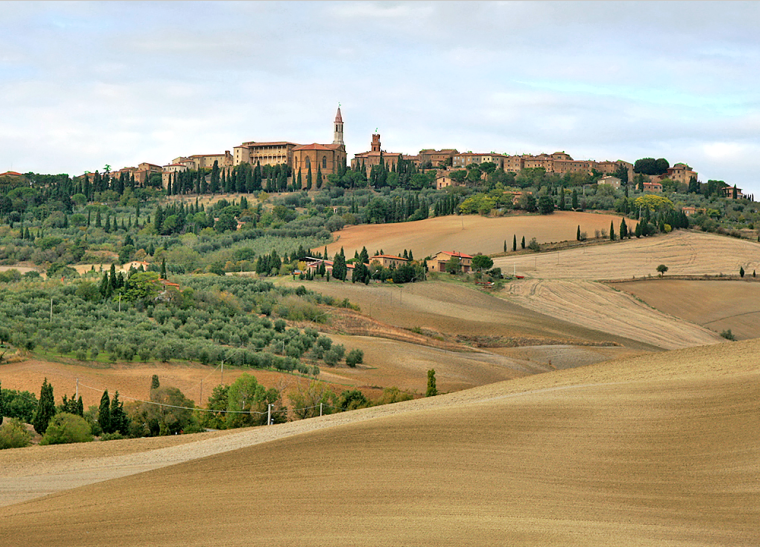 Today’s route brings you right into the heart of the stunning Val d’Orcia. The first part is again along mainly ‘strade bianche’ through the rolling hills, a beautiful landscapes of alternating vineyards and forests. Then you descend all the way down to the Orcia River. From here you walk back up again heading for the wonderful Ripad’Orcia, a small fortified village in a strategic position above the River Orcia. On the other side of the river lies the castle of Rocca d’Orcia and Monte Amiata, a former volcano, symbol of southern Tuscany and important today for its thermal water. You can then walk along the banks of the River Orcia and reach Bagno Vignoni. 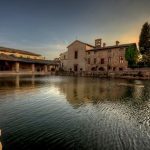 In alternative you can make the detour to the beautiful medieval village of San Quirico, have a drink in the square and a stroll through the Horti Leonini, a fifteenth-century garden, and then walk on to Bagno Vignoni. This village was built in the 13th century to allow Lorenzo de’ Medici and various popes to relax in healthy thermal water. Indeed, its peculiarity is that instead of the usual central square, there is a large thermal pool! Especially on cooler days, the effect of the rising steam is incredible. You then walk on to your overnight address for the night, Castiglione d’Orcia, on the other side of the Orcia River. Total walking distance: 12,5 (18 km.) Estimated walking time: around 3,5 hours + sightseeing time (5 hours with extra option). 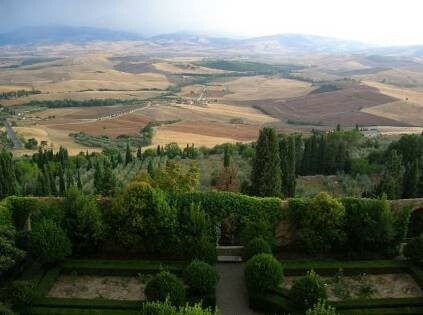 In case you want to see something more of the stunning Val d’Orcia you could opt for an extra walk to Pienza. 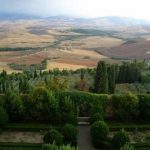 The first part of the route will be the same, but then you’ll walk on to San Quirico, and from there to Pienza, a small, perfectly laid out Renaissance town. 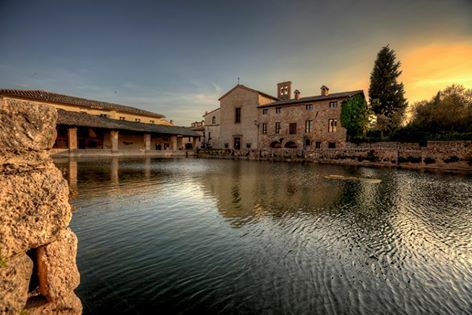 Here you have time to explore, and perhaps visit the beautiful museum, inside the Palace of Pope Pius II. 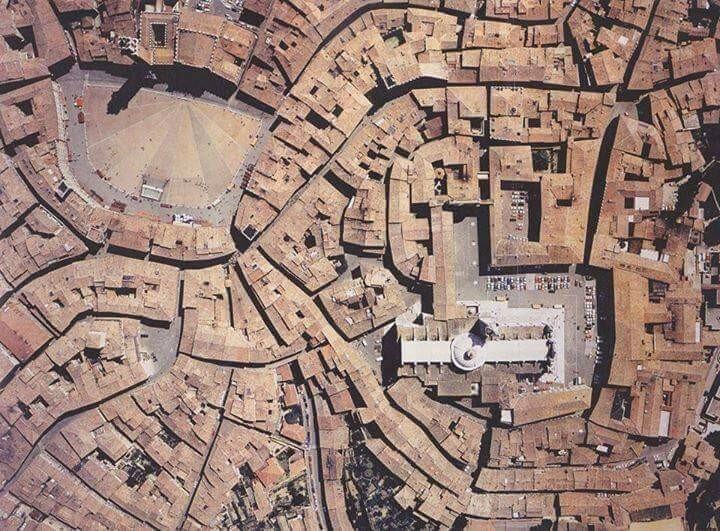 Pienza is often described as the “ideal city” or the “utopian city”. 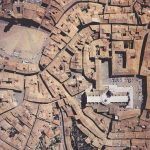 It certainly is one of the best planned of Renaissance towns, where a model of ideal living and government was attempted. It represented the so-called utopia of the “civitas”, based on the concept of a town able to satisfy the needs of a peaceful and hardworking population. Pienza’s location in the centre of the Val d’Orcia, a wonderfully harmonious valley, helps the town to embody the fundamental principle that humanistic architecture attempted to create a balanced relationship between Man and Nature. You’ll stay here in a beautiful hotel in the heart of town. 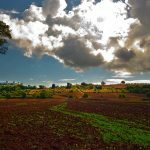 The next day you’ll walk down from Pienza to the thermal village of Bagno Vignoni, and then all the way down to the Orcia River. From here you walk back up again heading for Castiglione, a fortified village above the River Orcia, where you’ll stay overnight (or you could walk on to the hamlet of Gallina). This way the walk to Radicofani the day after will be shorter as well. Total walking distance: 12,5 (20 km.) Estimated walking time: around 3,5 hours + sightseeing time (5 hours with extra option). Today will be a long day: you leave the Val d’Orcia and head for Radicofani, continuing in southern direction. First you descend to the river Orcia, which you cross, after which a steep ascent brings you up to the fortified city of Rocca d’Orcia and Castiglione, dominated by its impressive castle. Then follows a long section of almost 20 km. of rolling hill. 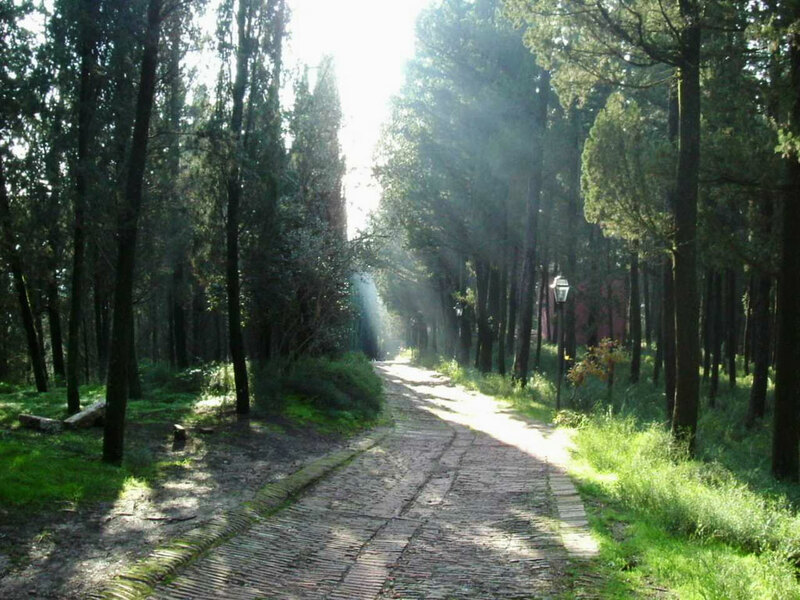 Halfway you reach the Via Cassia – where you walk past the remains of the medieval ‘’hospital’, testifying the pilgrim’s past of this old Roman road. Almost the whole time you’ll walk in the shadow of Tuscany’s (extinct) volcano, Mt. Amiata, and in sight of the strangely shaped high hill on which Radicofani is located. The last few km. 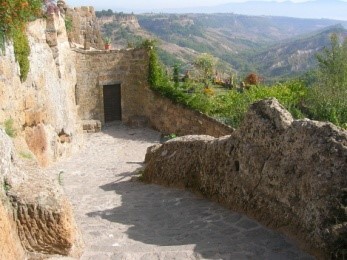 goes steeply up to the fortress, a tiring climb, but worth the effort, if alone for the views from the fortress. 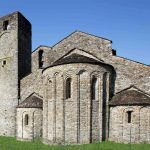 If you still have some energy you must visit the Pieve di San Pietro, a little jewel dating back to the thirteenth century, and perhaps after dinner, take an evening walk in its old town centre, admiring the magic of the illuminated fortress. Total walking distance: 27,5 km. Estimated walking time: around 7,5 hours. Today we’ll leave Tuscany behind, and enter Lazio, the region of Rome. For long this area has been on the border between Tuscany and the Papal state. Perhaps – in case you were too tired last night – you’ll find some time to look around in Radicofani and visit the fortress, before starting your daywalk, which today is definitely easier! With Radicofani being on the top of the hill, the first half of the walk is almost completely downhill. Therefore you can fully enjoy the scenery, beautiful hills with the silhouette of the Monte Amiata always in sight. After about 10 km. you reach the valley of the Paglia River, where you can enjoy a short flat stretch. Here you’ll cross the busy Via Cassia, but we’ll avoid following this route (leaving the ‘original Via Francigena’, but instead head for the charming village of Proceno, along perhaps one of the nicest sections of the whole route. The old town of Proceno, located in this beautiful landscape, is an ideal stop for the night. Total walking distance: 25 km. Estimated walking time: around 6 hours. Today we’ll look forward again to long, but a beautiful stage! The first part of the route goes down to the valley of the Paglia River again, where we reach the Via Cassia again. Of course we’ll avoid the main road, and along minor roads we’ll climb up to the village of Acquapendente. Through the Porta della Ripa you enter the old town centre, very much worth a visit (and a coffee break). Take some time to visit the Romanesque crypt beneath the Basilica del Santo Sepolcro, where, according to the tradition, stones bathed in the blood of Christ are kept. a long day. From Acquapendente the route goes through rolling hills and around lunchtime you’ll arrive in San Lorenzo Nuovo. From here you can get already a first glimpse of the big lake of Bolsena. 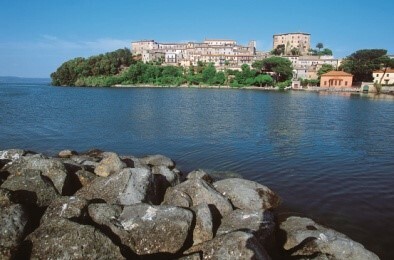 The route continues through forested hills, and then finally descends through the field to the beautiful city of Bolsena, which features two distinctive, but perhaps equally attractive parts: the old medieval city dominated by its castle, and the quaint lake side: where you can quietly stroll to relax the legs after yet another beautiful stage. N.B. 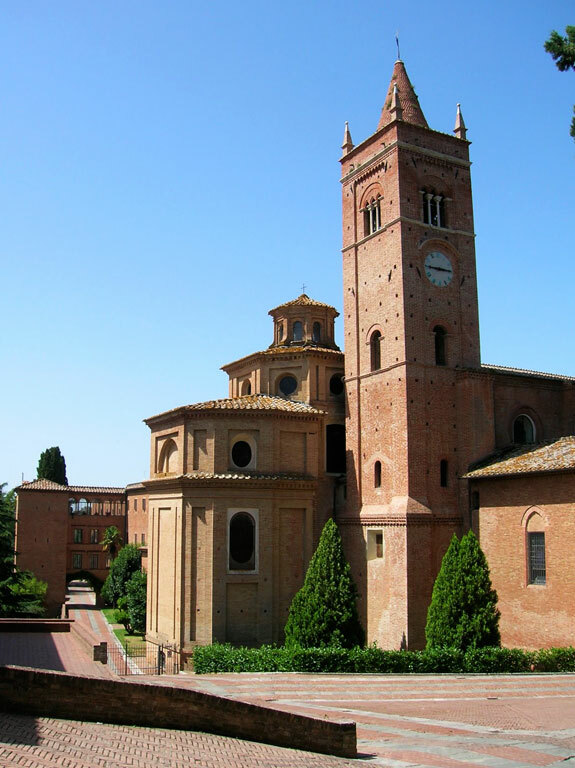 Also here you can make a short deviation from the ‘official’ route of the Via Francigena – cutting the stage in two pieces and allowing you to visit beautiful Torre Alfina – with one of the most interesting castles and a beautiful, intriguing nature reserve. Total walking distance: 28,5 km. Estimated walking time: around 7 hours. End of the tour. From Bolsena you travel to Orvieto, from where you can take the train back to Florence or Rome. Total walking distance: 16,5 km. Estimated walking time: around 5 hours. (several alternatives possible). All nights are spent in beautiful, characteristic family-run hotels (generally 2/3-star; 4/5-star on request). All rooms have en-suite facilities. On all nights you will be free to make your own dinner arrangements. You can choose from the wide choice of restaurants in the area. Your accommodation holder can give you good tips. No picnic lunches are included in the tour price, but these can be prepared for you by the accommodation holders, or materials for picnics can be purchased in the villages where you’ll be staying. On some occasions you have the option to have your lunch in a restaurant along the way. It is possible to upgrade this tour, staying in more luxurious 4-star hotels (where available). Moderate (3): Mostly moderately easy walks, with some long stages, involving some steep uphill walking, sometimes on paths with rough surfaces. On some days extensions or shortcuts are possible. Fitness: High standard of fitness is necessary: you should be able to walk for up to 7 hours a day in the hot sun on dusty or stony tracks. N.B. During summer the difficulty of this tour definitely increasesdue to the heat. We therefore advise against booking this tour during the period between about 14th July and 20th August. Most paths are relatively well maintained; you’ll follow most of the time the official route of the Via Francigena, well maintained. A large part of the route goes along so-called strade bianche (unsurfaced roads), easy to follow and very unlikely to get overgrown (we continuously check our routes – please help us by providing your feedback on the quality of the paths). Waymarking: A large part of the route is waymarked with the signage of the ‘Via Francigena’, but on some occasions we have found more interesting routes than those actually waymarked; therefore you should follow the route descriptions provided together with the maps. With these you will always be able to find your route. 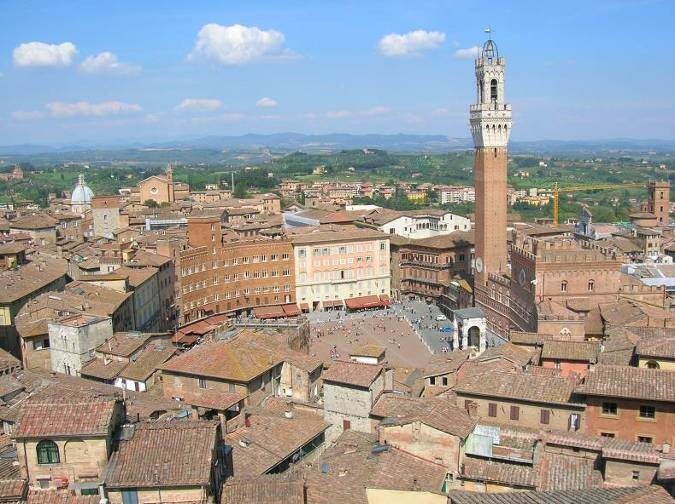 Arrival: The tour starts in SIENA, linked to PISA and FLORENCE by a frequent bus service. A taxi pick-up service can be arranged either from Florence (hotel, airport or train station), or from Pisa (airport). Departure: The tour ends after breakfast in BOLSENA. A frequent bus service can bring you TO Orvieto, from where you can travel by train to Florence or Rome. Upon request a taxi service is available to bring you directly to your next destination. N.B. Luggage transport is not included – available on request (120/140 per person – discounts for groups possible). It is possible to include some extra nights in your tour, in any of the accommodations ‘en route’. 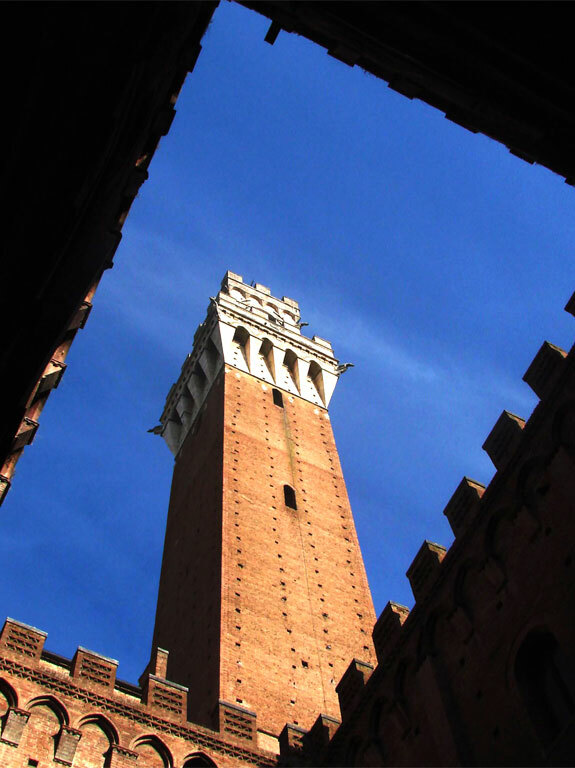 For those who have never been to Siena an extra day here is strongly recommended. At the beginning of the tour there is the opportunity to visit Florence. Details and prices on request. Halfway the tour the tour can be extended with an extra ‘loop’ through the stunning Val d’Orcia. 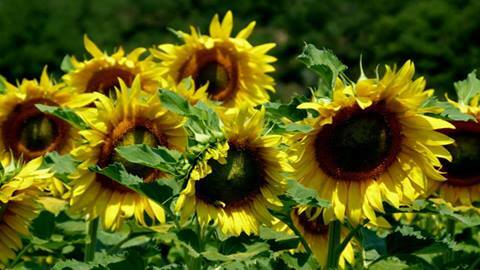 To get an idea of the several possibilities have a look at our Walking the Val d’Orcia tour. 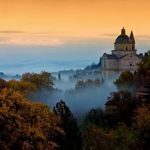 The tour can also be extended with a stay in beautiful Orvieto or with few days at a beautiful agriturismo for some relaxation in the countryside. Several superb accommodations are available. Details & prices on request. Of course the Via Francigena continues to Rome – the perfect extension for this tour! Longer and shorter versions of this tour are also available. Prices on request. 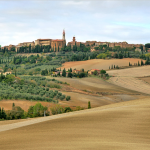 Check out our other Tuscany & Via Francigena tours as well! From Bolsena you can of course continue along the Via Francigena, which ends in Rome. This last part of the route brings you through the ‘Tuscia’ area, the heartland of the Etruscans, an ancient civilisation which flourished in this area before the rise of the Roman Empire. It is an area where the layers of history can all be explored: apart from the Etruscan heritage, of course the Romans left many traces and in medieval times a number of fortresses where built, while during the Renaissance Popes and other wealthy families from Rome built their villa’s here, often surround by superbly landscaped parks. It is also an area which features a great number of natural wonders, due to its volcanic nature. A walk around the volcanic crater lake is a must! Of course the closer you get to Rome, the busier it will be. For that reason you will have to chose your route carefully. Some busier parts can possibly be avoided using the public transport. The official route can be divided into 7 stages (Bolsena – Montefiascone – Viterbo – Vetralla – Sutri – Campagnano – Isola Farnese/La Storta – Roma), but many other interesting options are possible. Please contact us to know about the actual possibilities.